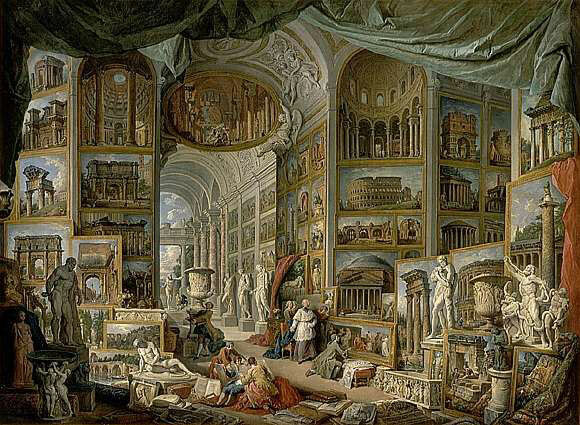 This picture, which has as its pendant a Gallery of Views of Modern Rome , depicts an imaginary museum made up of vestiges of ancient Rome. Its architectural monuments are conjured up by means of a gallery of paintings which is, in some way, a repertory of Pannini's tireless studies of the Roman past. Compelling for its perspectival combinations and its cumulative effect, the painting is eloquent testimony to the archeological fervour in mid-18th century Europe which followed upon the discoveries of the buried cities of the Herculaneum and Pompeii.